How good was yesterday's weather!? My cousin and I made the most of the first warm day of the year by making a little road-trip to the west side of town for some German-style food-filled fun. Yarraville is full of trendy cafes, restaurants, food shops and other pleasant weekend activities. I do realise that I'm extremely late on the Yarraville bandwagon, but the West side is FAR, ok! I first read about Hausfrau in Epicure some months ago, and I knew I had to go when I read that they had Bienenstich cake. (It's my favourite German cake, remember?) Hausfrau is owned and run by an Australian chef and her Austrian husband, and remembering my trip to Vienna in '06, I was understandably excited. 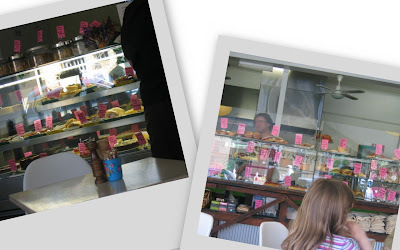 The cafe itself was very cute - all pastel colours, shelves and shelves of food, and a giant whisk hung up on the wall. However, disappointment soon set in, when the very friendly guy at the counter informed me that they had no bienenstich - he said that their pastry chef had taken it off the menu and it probably wouldn't come back for a couple of months. Whaaa...? My first instinct was to beat my fists on the counter and yell "Noooooo! ", but I bravely fought back tears and instead examined the many cabinets of food. Hausfrau is well known for their sweets, and they did indeed have a large selection of gorgeous-looking cakes and pastries - honey madeleines, cherry frangipane tartlets, pfeffernüsse, brown butter shortbread, Sachertorte, baked chocolate mousse cake with raspberries, just to name a few. They also serve toast, muesli and many savoury treats. Particularly eye-catching were kranskys wrapped in pastry with sauerkraut, a super-creamy croque monsieur, and sausage rolls. You can also buy a selection of ice-creams, Noisette breads, and Hausfrau tee-shirts. I don't know if I'd wear a Hausfrau tee-shirt, but I wouldn't mind buying one of their cute aprons if they sold them! (See one in the first picture, hanging outside their door). I really, really wanted that pastry-wrapped kransky, but it just seemed way too unhealthy. Instead, I got a mini sausage roll ($2) and a sweetcorn and parmesan hotcake ($5.50). They certainly looked beautiful. The sausage roll was very cute and delicious, but the hotcake was quite disappointing. It was way too sweet. I know sweetcorn is sweet, but the sweet relish and lack of parmesan just sent the balance of the dish off-kilter. I could only eat half. (I know, me!) I should have just got that kransky! My cousin, who doesn't eat pork or red meat, opted for the mushroom and artichoke strudel. This one was quite nice, with its flaky pastry and intensely mushroomy filling. My cousin, as with the savouries, made the better choice with a surprisingly light ginger pudding with sticky toffee sauce. Even though I wasn't bowled over by Hausfrau's food, the service and decor were great, and I think it was a great place to sit down and while away a weekend afternoon. It was pleasantly busy, but not super-crowded. Now that I've got a grown-up job, my cafe-visiting days are limited to the weekends. Incidentally, I used to think I wouldn't mind being a hausfrau (that's German for housewife). We all know how much I love to cook! But there's no way I could rely on someone else for my money. So I guess it looks like I'll keep working for the moment. And speaking of being independent and self-reliant, stay tuned, as your intrepid blogger dons her Fraulein MacGyver apron and starts whipping up her own bienenstich. Next stop was Andrew's Choice butcher, just around the corner from Hausfrau. And if Hausfrau was slightly disappointing, Andrew's Choice exceeded all my expectations, with their dazzling array of continental sausages and smallgoods. Andrew's Choice has developed quite a reputation for the quality of their fresh and smoked sausages, hams and smallgoods, and make quite a few of my beloved German specialities. They make everything in house, and their hams are smoked over a German hardwood (minds out of the gutter, kids). The majority of that delicious stash was carefully wrapped up, labelled and stored in my freezer. I can't drive all the way out to Yarraville whenever a wurst craving hits! Andrew's also grill sausages outside the shop to sell. In addition to my sausage-stash, I got a $3.50 grilled cheese kransky with onions to eat on my way to the car. Yum-to-the-yum! It more than made up for the lacklustre lunch. According to my cuz, Aldi was having specials on German food, so we headed there next. Going to Aldi always reminds me of Germany. In addition to cheap almonds and macadamias, I picked up some beer, spätzle, a rosti-in-a-packet, rohtkohl, sauerkraut and some German roast coffee. I don't hold high hopes for a bargain brick of German ground coffee, but I couldn't help myself. Thanks to my cuz for joining me on this little road-trip! I can't wait to get stuck into my purchases. Oh AWESOME!!!!!!!!! Thanks for the tip! That's some interrrrresting disappointment at Hausfrau! 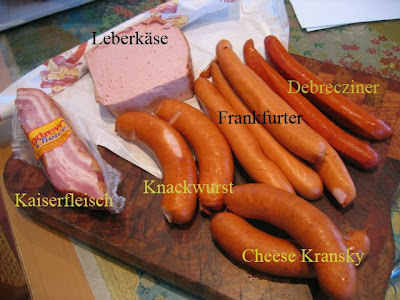 As for the butcher... if he makes his own Leberkäse then I'm going going going. Laura - Hehe... I like "Rhabarbermarmelade". Oh and Duncan I see that in my zest for long hard German words I mistakenly typed "gurkenkartoffelsalat" instead of Gurken und Kartoffeln Salad". Ups! Gimme a cup of coffee!